Liability in 18-Wheeler Accidents - Driver or Company? | Branch & DhillonBranch & Dhillon, P.C. Who’s Liable in an 18-Wheeler Accident – Driver or Company? Determining who to sue in an 18-wheeler accident can be tough, even when it’s easily apparent that the semi driver was at fault. If you’ve been injured in this type of accident, you may be wondering how best to receive compensation. There are a few factors you must consider when deciding whether the driver, the trucking company, or even the truck manufacturer should be named as a defendant in your lawsuit. How is the Tractor-Trailer Driver Employed? The primary factor that will determine which party (or parties) to name as defendant in a semi-truck accident is the driver’s employment status. If the driver is an owner-operator, there is no separate employer to sue. 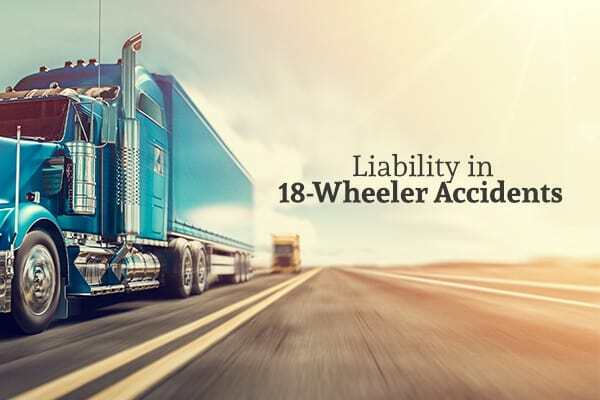 Fortunately, most states require owner-operators to carry additional liability insurance to ensure that anyone they injure in a collision has the ability to recover financial damages. If the driver is instead employed by a trucking company, you will usually be able to sue both the driver and the employer, as long as the facts establish that the driver was acting within the scope of their employment at the time of the accident. There are some situations, such as when an accident takes place after the driver has completed their work tasks and is headed home, where determining whether the accident was “within the scope of employment” can be tough. Another complication can arise when a driver works on behalf of a trucking company, but the company argues that the driver is an “independent contractor” – not an employee. If the driver truly is determined to be an independent contractor, the trucking company that provides them with work won’t be liable for the accident; but in many cases, this claim just doesn’t hold water. In order for a driver to be considered an independent contractor, they essentially need to act as an owner-operator, minus the truck ownership. Being an independent contractor means that the driver can dictate their own routes, decide when to accept or turn down work, and make other decisions about the nature and type of work performed. If a trucking company sets the hours, rates, and routes for the driver, it’s unlikely that a court will determine that the driver is solely liable. What Caused the Semi-Truck Accident? This can be a simple question with a sometimes complex answer, but determining exactly what caused the 18-wheeler to collide with your vehicle can be the key when deciding who to sue. In some cases, an accident may result from a tractor-trailer driver who simply isn’t paying attention and changes lanes without warning or fails to brake in time to avoid a rear-end collision. Often, this means that the driver is individually responsible. His or her employer may share this responsibility under the theory of respondeat superior if the driver was acting within the scope of employment at the time of the accident, but actions that are outside this scope of employment may not implicate the employer. If a driver fell asleep at the wheel or crashed while exceeding the posted speed limit, it’s possible these actions could mean the employer is primarily responsible. Many semi drivers are under immense pressure to travel hundreds of miles in a short period of time or to get back on the road with just a few hours of rest. If the company’s policies encouraged this type of behavior, even indirectly, you may be able to argue that the accident would not have happened if not for the employer’s reckless or negligent behavior. In other cases, the accident may not have resulted from the driver’s inattention or the employer’s potentially dangerous policies, but the driver’s purposeful and reckless behavior. A semi-truck driver who initiates or responds to a road-rage confrontation or who gets behind the wheel while under the influence of alcohol or drugs may be individually liable for any harm that follows from these actions. In cases of drunk driving accidents, the one who served the alcohol may also be liable. The final group of cases involves situations in which neither the driver nor the employer was responsible the collision. A malfunction in the engine, brakes, tires, or other components of the vehicle could cause an accident despite the driver’s best efforts to prevent one. For example, if a semi-truck’s brake line bursts when the brake is depressed suddenly, sending the vehicle careening into a line of stopped cars ahead of it, this case is likely to be litigated as a product liability lawsuit rather than a more traditional personal injury one. However, in some cases, you may still be able to implicate the driver or employer if you argue that a proper pre-journey inspection should have revealed the issues that caused the crash. While this can give you a framework for the information you’ll need before you file a lawsuit, doing the legwork to get this information on your own can be tough. If you’ve been injured in an 18-wheeler accident and aren’t sure how to proceed, contact Branch & Dhillon at (817) 533-3430 or visit our website today to schedule your free consultation. I Think My Parent is Being Abused in the Nursing Home. What Can I Do?